Echo Spot (Official Amazon) Stand Boxed. An official Amazon Echo Spot adjustable stand, in perfect condition. Amazon Echo (2nd Gen) - Smart speaker with Alexa - Heather Grey Fabric. Alexa is always getting smarter and adding new features and skills. Just ask for a song, artist or genre from Amazon Music, Spotify, TuneIn and more. Plays music from Amazon Music, Spotify, TuneIn and more. Listen to audiobooks from Audible, podcasts, radio stations, news briefings and more. Now with multi-room music, Alexa can play across any Echo devices available for Amazon Music and Tune In. The Titan Black color and its simple design will fit in any interior space. High Resolution Audio. Learn more about High Resolution Audio. Get the high quality music experience you desire that matches your musical taste. 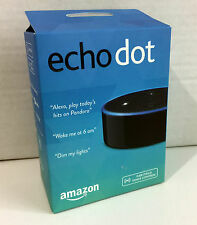 Amazon Echo Dot. 3rd Generation. New, unused. Unwanted gift. You can play music from Amazon Music, Spotify, TuneIn and more. You can also listen to audiobooks from Audible, podcasts, radio stations, news briefings and more. Want to play music on an Echo in another room?. Very little use, pristine condition. 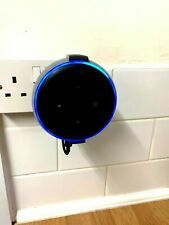 Amazon Echo Spot. Full working order. Download any of Alexa's skills to enable the voice one to do everything you need, even customising the sound however you like in the KS app; KitSound are continuously updating so the Voice One is only going to get smarter. LG WK7 Smart Speaker - Black. Condition is Used. Dispatched with Royal Mail 2nd Class. Speaker uses Google Assistant so essentially same experience as a Google home. Came with my TV as a gift. Took out of box and used once. Amazon Echo Dot (3rd Generation) Smart Speaker with Alexa - Charcoal. Condition is New. Dispatched with Royal Mail 1st Class. Hands-free voice commands with Google Assistant. 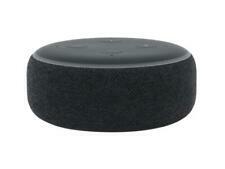 Amazon Echo (2nd Generation) Smart Assistant - Charcoal. Condition is Used. Dispatched with Royal Mail 1st Class. 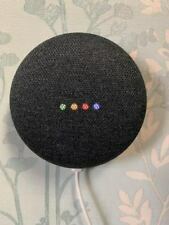 Google Home Hub chalk colour. This is in excellent condition and rarely used. I also have the receipt from PC world's. It still has 6 months warranty. Google Home Hub brings you visual help for any moment at home. With the Google Assistant built in, use your voice to view your latest events and reminders, and control smart devices from a single dashboard. Ask questions, and get visual, immersive answers from Google, and helpful videos from YouTube. Plus, play your favorite songs on a crystal-clear speaker, and relive your memories with Google Photos. Get help with the little moments, so you can enjoy the big ones. Amazon Echo (2nd Gen) Smart Speaker - Charcoal; BRAND. Condition is New. Dispatched with Royal Mail 2nd Class. 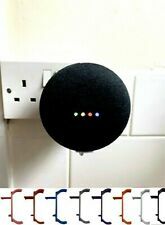 This wireless speaker can connect to the main streaming services like YouTube Music, Spotify and Deezer with a simple voice command – all you have to say is “Hey Google, play Discover Weekly on Spotify” and you'll be bopping your head in seconds. Amazon Echo Spot Smart Assistant - Black. Technical specifications for AMAZON Echo Spot - Black. Play your music through the Echo Spot, or through multiple Echo devices simultaneously. Alternatively, connect to speakers via Bluetooth or auxiliary cable.